ZENOLOGY is peace of mind knowing that you're buying some of the highest-end stemware in the world at half the price. Brilliantly lightweight and elegant, ZENOLOGY glassware is handcrafted and mouth-blown in the same European factories as other well-known brands. Designed exclusively for Wine Enthusiast, we've erased the usual high-end luxury brand markup and passed the savings on to you. That's ZENOLOGY! How many glasses of each type come in the complete collection? 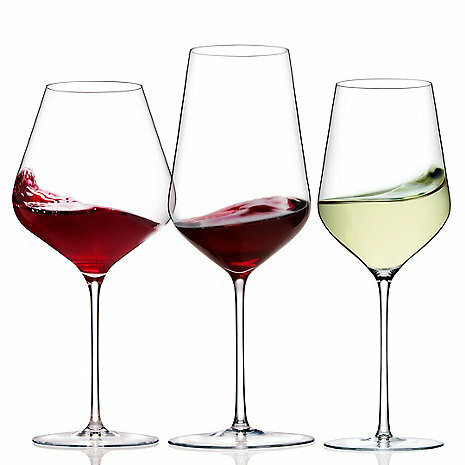 BEST ANSWER: The ZENOLOGY Glassware Complete Collection comes with six wine glasses. The set includes 2 Pinot Noir Glasses, 2 Cabernet Sauvignon Glasses, 2 Universal Glasses and it's available with or without a decanter. 2 each, one broke within one month of purchase and they replaced it. Are the Zenology and Fusion Air the same glasses? If different, what's the difference? BEST ANSWER: The ZENOLOGY Wine Glasses and the Fusion Air Wine Glasses are different. The mouth width and the base width are larger on the Zenology, they are more slender glasses, and also tend to be taller than the Fusion Air. The Fusion Air glasses all have a larger capacity than the Zenology glasses. Had a few friends over recently for a last minute dinner party & wanted to make it elegant, even with almost no planning. We did apps in the kitchen around the island and then took seats at the dining room table, set with Zenology glasses. Immediately, the table was transported to a higher level of dining elegance. We opened different wines and tried all 3 stems and they were a total hit as my friends marveled at their lightness and beauty. Love my new wine glasses ! Have been using both the Cab and Universal glasses for several months now. One of my better purchases. Have gotten many compliments - especially on lightness and elegance. The glasses themselves become an unexpected topic of conversation. Have put the pieces in my Miele dishwasher daily and can state these pieces are durable. The Cab and Pinot glasses are quite voluminous so takes much more space in the dishwasher. I use the Universals much more frequently. These glasses are worth every cent! Closet to Zalto you can get. I have lots of wine glasses but these are the best! When I put my nose into these glasses with wine, Pinot Noir the best, I know it was great! The glass in the glasses is pure and they are large!! I have a large glass bar where the wine glasses go up to the ceiling. With the ZENOLOGY glasses being larger I had to move things around!! I bought this set for my spouse and me to use. It's nice to have the variety and not have to buy a set of 6 of each. The glasses are lightweight and very clear. The 10-year breakage warranty is a great bonus! Great set at a great price. Love them. They are thin and light so always be careful when handling. wouldn't recommend putting them in the dishwasher (My choice). good decision to purchase. Very light weight and elegant.. They feel like they are fragile but I haven't had a problem with breakage so far. I use them nearly every day but they are also great for a special occasion. Lightweight with an elegant flair!!! Light, elegant, and refined stemware. Enjoying our purchase very much. Durable, light, stylish and worth the price. I have nyend to he more to gift to friends. Elegant and functional, these glasses are perfect! Loved the quality of the glasses. If one should break- and we are handling them with the proverbial kid gloves what is the process for having them replaced over the 10 years? Makes a marked difference in the taste of my wine. These are really great. They are light and look a lot like the Zaltos. I am really pleased that they have a warranty against breakage. Light weight. Large. Perfect. Perfect. Perfect. Perfect. Perfect perfect. Perfect. We bought these as a gift & could't be happier. Great quality,packaging & fast delivery. Toasts resonate like healing Tibetan bowls. Everything tastes better in these beautiful glasses. Lovely glasses that enhance the experience of enjoying wine. My new glasses put wine to a whole new level. So proud of them. Will buy more soon. These glasses are of high quality and are absolutely beautiful. They are more durable than higher end glasses and are just as aesthetically pleasing. We have Reidel "O" Stemless Glasses for most of our everyday wine drinking. BUT, when we really want a SUPERB Wine Tasting Experience, we bring out our set of ZENOLOGY glasses. WOW Just love the light weight, and exceptional taste these glasses provide. Gary L. Stevens the Preserve @ SaddleBrooke Tucson, AZ. Not only does wine taste delicious in these glasses, they take part in making it all art. The stems are gorgeous, weight is lovely and you just feel better about your experience when you are holding them. My thanksgiving table is going to look amazing with these!! These glasses are beautiful! So lightweight and pretty, they class up any occasion. These glasses are very nice but they are also very large. The universal glass is as big as a typical large cab glass. Very light and thin. 1 of 8 broke on the way here but replaced. vaguely remember some long guarantee if break but not certain. Have to be very careful when washing them. Beautiful but dainty! Swirl but not to hard. Sip but don't bite. Ha - tongue and cheek. Very fun, elegant glasses but I broke three In two weeks. Not the sturdiness of a Reidel! They are nice glasses but very fragile. They are also very thin. But elegant looking. BREAK WAY TOO EASY! NO Wonder They Offer To Replace! I was so excited to get my new glasses. I had done SOOO much research and even have an expensive set of Reidel Wine glasses & changed to these earlier this year (1-2018) and I am already going to have to call to get a SECOND glass replaced due to the fact that they are SOOOO FRAGILE!!! I take VERY good care of my wine glasses: NO dishwashers, NO dish rack, etc. I HAND WASH my glasses and dry them with the SPECIAL WINE cloth and both times they have broken in my hand! Will not buy again. The glasses are oddly shaped and the stems are very thin and fragile feeling. The size of the Pinot glasses seems disproportionate to the diameter of the stem making them feel awkward when there is wine in the glass.